Flounder is a common name for various marine fish in the Order Pleuronectiformes (flatfish), and in particular those comprising the families Bothidae (lefteye flounders), Pleuronectidaea (righteye founders), Achiropsettidae (southern flounders), Paralichthyidae (large-tooth flounders), and Psettodidae (spiny flounders). 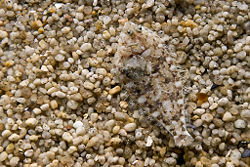 All members of the order—which includes soles, flounders, halibuts, plaice, sole, and turbot—are characterized by adults that are not bilaterally symmetrical, with one eye in the upright swimming, bilaterally symmetrical, young flatfish migrating to lie adjacent to the other eye, and the adults then swimming on the eyeless side. The term flounder is not a formal taxonomic rank, but rather is the common name used for numerous species scattered over several families. Sometimes the fluke, halibut, and plaice are types of flounder. Flounders contribute value to ecosystem and humans. They are integral in marine food chains, consuming fish, crustaceans, and polychaetes, and in term being consumed at various life stages by such invertebrate and vertebrates as jellyfish, crabs, shrimps, fish, birds, seals and sea lions. For humans, flounders are a valuable food fish, being prepared whole or in fillets, and being broiled, steamed, sauteed, or steamed. Flounders are a type of flatfish. Flatfish are an order (Pleuronectiformes) of ray-finned fish, also called the Heterosomata. They sometimes are classified as a suborder of Perciformes. Flatfish are a very distinctive group in that the adults are not bilaterally symmetrical, the only fish with such asymmetry and the only vertebrates that deviate so radially from the bilaterally symmetrical body plan (Grzimek et al. 2004). The young flatfish are bilaterally symmetrical and swim upright as with other fish, but early in development one of the eyes migrates to the other side of the cranium, across the top of the skull, and positions itself adjacent to the eye on the other side (Nelson 1994). The fish then swims with the two eyes on the upper side and lower side is blind. The metamorphosis also involves the upper side generally pigmented and the lower side light colored, and changes in dentition and fin placement. Most species face either their "left" side upward (both eyes on the left side and lie on the right side) or else face their "right" side upward, but some species have individuals of either orientation, such as the starry flounder (Platichythys stellatus) (Nelson 1994). The other distinguishing features of the order are the presence of protrusible eyes, another adaptation to living on the seabed (benthos), and the extension of the dorsal fin onto the head. The body is highly compressed and somewhat flat on the blind side and rounded on the eyed side (Nelson 1994). Adults are almost always lacking a swim bladder (Nelson 1994). Flatfish are carnivorous and benthic. Flatfish have various common names, including flounder, sole, plaice, halibut, dab, and turbot. There are about 570 extant species in this order, placed in 123 genera and 11 families (Nelson 1994). They are almost exclusively marine, but about four species likely occur in freshwater and some others are marine but occasionally enter freshwater (Nelson 1994). This order includes many important food fish. The name "flounder" is a common name, referring to several geographically and taxonomically distinct species. 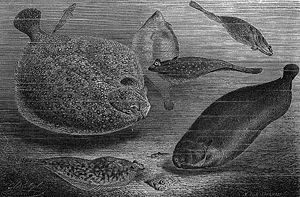 These include the halibut (Hippoglossus in Pleuronectidae), plaice (Pleuronectes in Pleuronectidae), dab (Limanda in Plueronectidae), and fluke (Paralichthys in Paralichthydae). However, the common names are applied to fish in different families. For example, Paralichthys californicus is known as the California halibut. In Europe, the name flounder refers to Platichthys flesus. Soles generally are classified in Achiridae (American soles), Soleidae (soles), and Cynoglossidae (tonguefishes). Lefteye flounders (Bothidae) are found in the Atlantic, Indian, and Pacific Oceans (Nelson 1994). Their eyes are sinistral and the pelvic fin base on the eyed side is longer than on the blind side (Nelson 1994). Righteye flounders (Pleuronectidae) are found in the Arctic, Atlantic, Indian, and Pacific Oceans, and some are occasionally in brackish water and rarely in freshwater (Nelson 1994). Their eyes are almost always dextral and they lack oil globule in the yolk of egg (Nelson 1994). The large-tooth founders (Paralichthyide) are found in the Atlantic, Indian, and Pacific Oceans and their eyes are usually sinistral, with the pelvic fin bases short and nearly symmetrical and the pectoral fins branched (Nelson 1994). A species of Pseudorhombus and Citharichthys ascends freshwater rivers from the Ocean in Africa (Nelson 1994). The southern flounders (Achiropsettidae) are found in the Southern Hemisphere, Antarctic and sub-antarctic, and their eyes are sinistral, the body extremely compressed and the pectoral fins rudimentary or absent (Nelson 1994). Psettodidae (psettodids or spiny flounders) are found in western Africa and Indo-West Pacific, and is characterized by a pelvic fin with one spine and five soft rays (Nelson 1994). Psettodidae, which has only one genus, Psettodes, is in a separate suborder (Psettodoidei) from the other flounders (Pleuronectoidei). Flounder sizes typically vary from five to fifteen inches, though they sometimes grow as large as three feet in length. Their breadth is about one-half of their length. 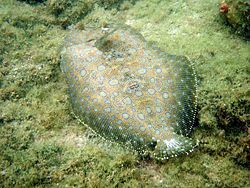 Except for the spiny flounders (Psettodidae), flatfish lack spines in their fins; all of the fin rays are soft (Grzimek et al. 2004). Flounder are ambush predators and their feeding ground is the soft mud of the sea bottom, near bridge piles, docks, and other bottom encumbrances; they are sometimes found on bass grounds as well. Their diet consists mainly of fish spawn, crustaceans, polychaetes, and small fish. Flounders are eaten by predators at all stages. The eggs and larvae are eaten by jellyfishes, ctenophores, shrimps, and fish, and young and newly settled flounders are eaten by crabs, shrimps, and fish (Grzimek et al. 2004). Juvenile and adult flounders are eaten by a variety of predatory fish, as well as birds, seals, and sea lions (Grzimek et al. 2004). Some flounders have a remarkable ability to change the color and color patterns of their surfaces to match the patterns and colors of the backgrounds on which they lie (Grzimek et al. 2004). Flounders are found worldwide, in all oceans. They range from shallow water to deep-water habitats, with most species found in habitats ranging from near shore to depths of about 100 meters on the continental shelf (Grzimek et al. 2005). In a surprise finding, among other sea creatures, flounders were found at the bottom of Marianas trench, the deepest location on the earth's crust. Swiss scientist Jacques Piccard and US Navy Lt. Don Walsh reached a depth of 10,900 meters (35,810 feet) and were surprised to discover soles or flounder about 30 centimeters (one foot) long, as well as shrimp there. Flounders are popularly captured for food. Not only are the medium-sized and large fish consumed, but in some regions even the smaller species are eaten (Grzimek et al. 2004). Small fish also are captured as by-catch in shrimp trawl fisheries (Grzimek et al. 2004). This has resulted in threats to their population size. World stocks of large predatory fish and large ground fish, such as sole and flounder, were estimated in 2003 to be only about ten percent of pre-industrial levels, largely due to overfishing and particularly commercial fishing (Clover 2004; Myers and Worm 2003). The Annual World Flounder Tramping Championships take place at Palnackie, Scotland, usually in the last week of July or first week in August. Competitors brave the mud flats of the estuary of the Urr Water in sun or rain to try and catch the heaviest fish, or the largest catch, or even the smallest fish for prize money and a trophy. Fish are caught by walking across the mud and trapping them below the competitor's foot. Leisters, which are traditional three-pronged spears, are no longer permitted to aid capture. Clover, C. 2006. The End of the Line: How Overfishing is Changing the World and What We Eat. New York: New Press. ISBN 159558109X. Myers, R. A. and B. Worm 2003. Rapid worldwide depletion of predatory fish communities. Nature 423: 280-283. List of Common Names for Flounder at FishBase. This page was last modified on 14 April 2017, at 19:36.